The Memoirs are a uniquely detailed source for the history of the northern half of Ireland immediately before the Great Famine. They were written in the 1830's to accompany the 6" Ordnance Survey maps, but with one exception were not published at the time. In this new edition they act as a nineteenth-century Domesday book and are essential to the understanding of the cultural heritage of our communities. The Memoirs document the landscape and situation, buildings and antiquities, land-holdings and population, employment and livelihood of the parishes. 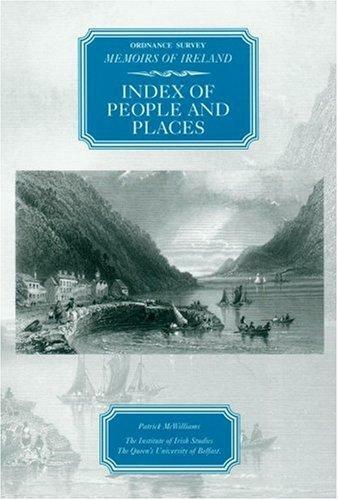 Ordnance Survey Memoirs of Ireland: Index of People and Places provides over 100,000 entries for people and places, indicating the parish, county, volume and page number of each reference. Buildings associated with localities are included. Drawings and O.S. maps used in the volumes are indexed separately. This index will be of great value not only to owners of any of the volumes in the series but also to all those interested in the history of Ireland, local history and genealogy.